Today marks my inaugural flight of the PMDG 777. I must say, I’ve been very excited for this moment for quite a while now. We here at Angle of Attack have been working on our 777 Training for ever a year now, so the aircraft couldn’t come soon enough. After just a few short hours with the aircraft, what are some of the first things I notice? Throughout this post, I’ll share those thoughts and ideas with you in an attempt to get you all pumped up to fly this bird yourself. First impression was, “This is better than the 737! How is that possible?” But really, you’ll instantly notice a quality difference in a subtle way. This aircraft has a powerful, realistic presence. Because I’m already very familiar with the 737, and have done a little training on the 777, getting into the aircraft was a breeze. 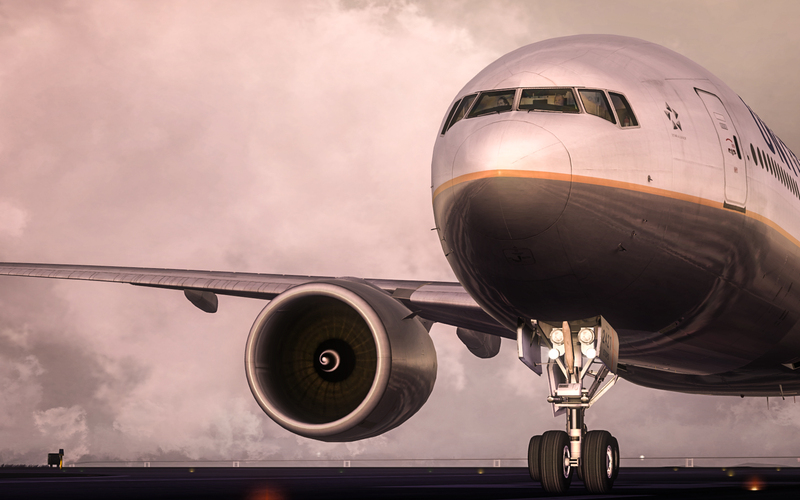 The automation of the PMDG 777 makes it easier to setup and fly than the 737. There are simply many background systems doing automated processes. I quickly fell in love with the ECL (Electronic Check List) and can see myself using it a lot. PMDG modeled it beautifully. You click off an item, the cursor moves down to the next item without you needing to move it. Ingenious. There are also a lot of other new features in an already familiar format from PMDG products. For example, there is an automated Ground Operations now- set your turn time, fuel, and the aircraft will be fueled up and even automagically pushed back at departure time. 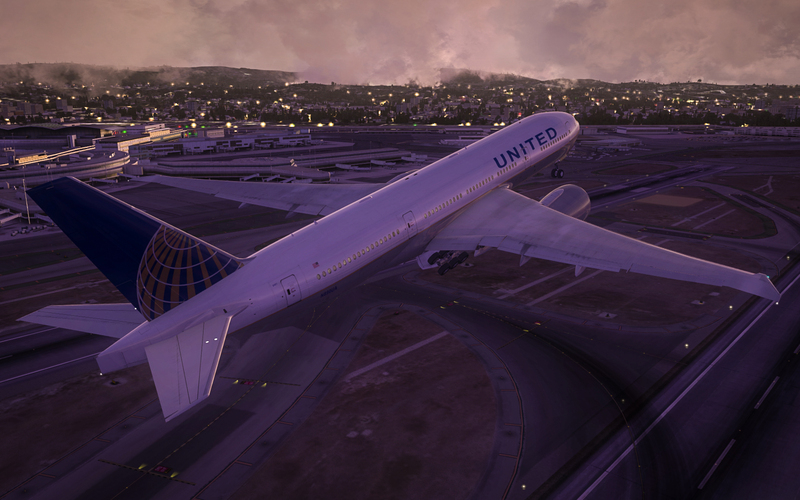 You’ll notice throughout these screenshots that the 777 looks much more reflective than other PMDG products. the reflective properties just feel accurate. 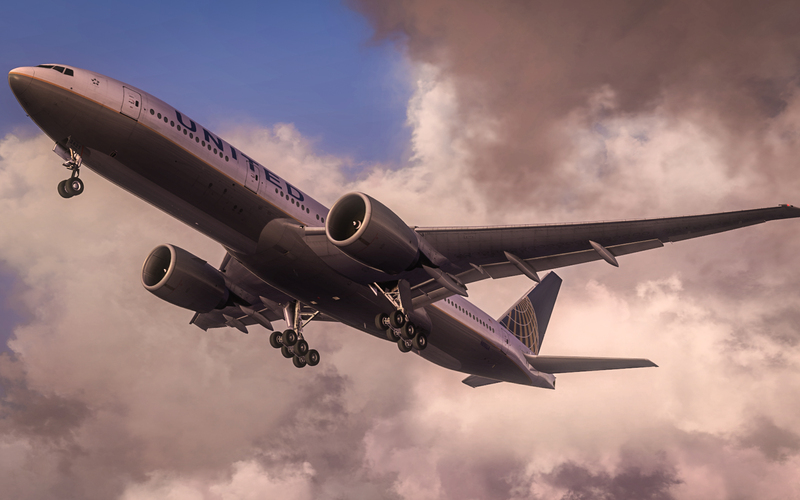 This adds a surprising amount of realism to the look and feel of the aircraft. 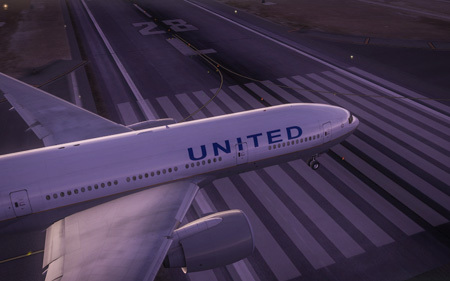 Now, with an aircraft like the 777, which is larger than the 737, we’d see a larger hit in frame rates, right? Wrong. 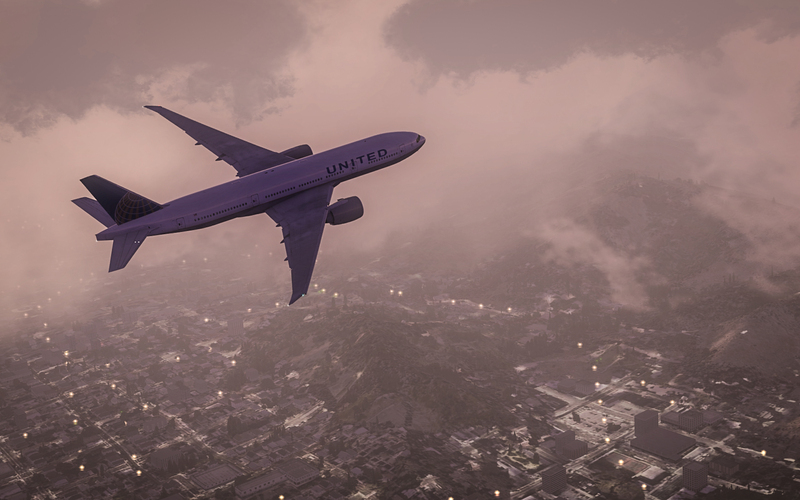 The PMDG 777 is better on frame rates than the 737. Believe it. It’s true. And you’ll notice it straight away. One thing you’ll notice throughout any flight, is the vast library of sounds that flawlessly seem to play a mechanical orchestra. We all love the sound of fans in the cockpit, spooling of the engines, and the rumble down the runway. 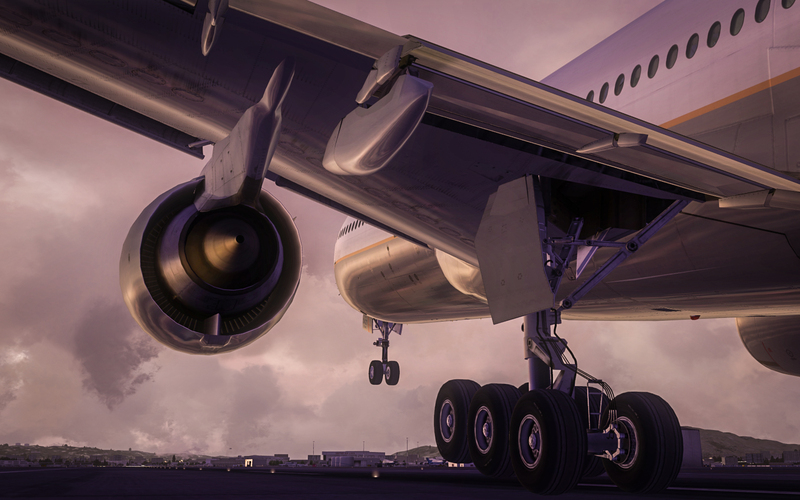 There will always be the PMDG way of pushing back, and also other services you can use for Ground Equipment, like AES or GSX. On my first flight, I didn’t fuss too much with these programs, and simply used the PMDG 777 pushback function. 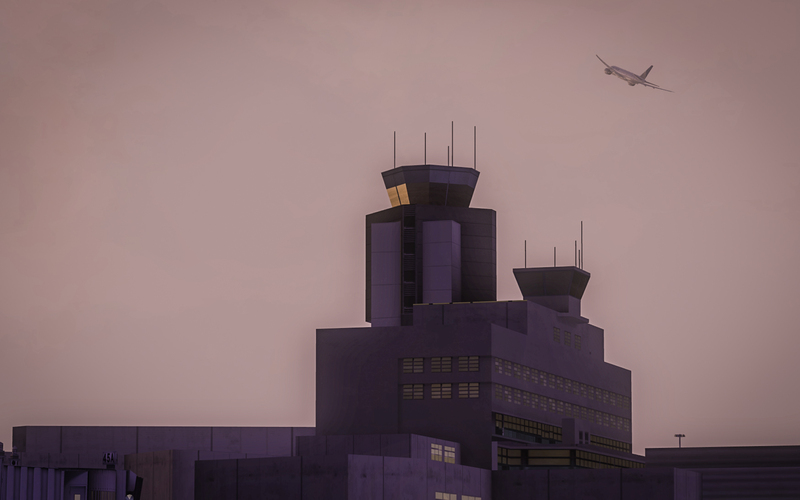 A bit off topic, but it’s worth mentioning that the airport used here comes from the amazing development ground FlightBeam, and this airport is San Francisco, KSFO. As we get to the shots here of takeoff roll, let me talk a bit about that. First, it’s really easy to get this aircraft setup for takeoff. If you’ve gone through our 737, you’ll get pretty close to getting it right the first time. Moving the power forward for the first time is a dream come true. This machine is stable. It’s not a nimble jack-be-quick like the 737. Although, that’s not to say it doesn’t have plenty of power. You’ll notice the power right away! I used -20% power for my takeoff and climb. 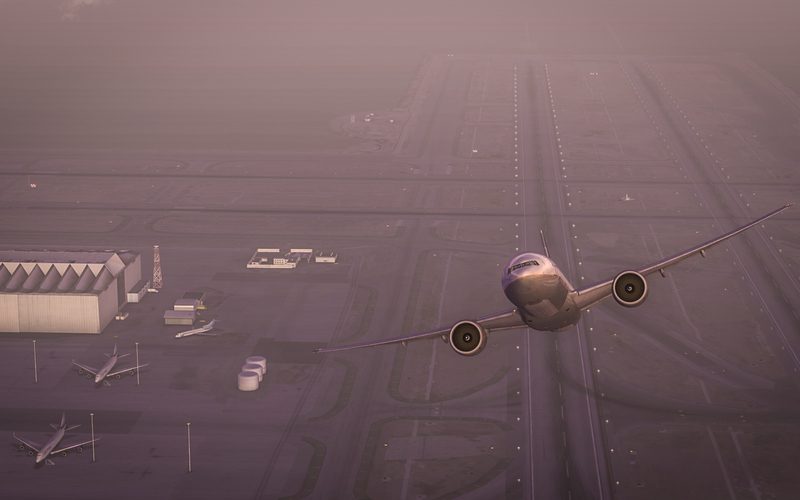 I took off a third the way down the runway, and had an initial climb of 5200 FPM. Once CLB mode kicked it, it tamed down a bit during the acceleration and flap cleanup. In the PMDG 777, you’ll notice something on takeoff role you hadn’t really felt before- you’ll feel for the first time you’re really in the aircraft. Especially if you’re at an add-on airport, there’s the illusion that “all this is real”. The sounds and bumps and shimmies on the takeoff role don’t leave much for the imagination. It makes for a very realistic experience, and something you’ll be longing to do over and over again. Once you reach rotate, she just wants to fly! What can I say about hand flying the machine? It’s smooth. Astonishingly smooth. This means it’s very easy to fly. Between the FBW (Fly-by-Wire) system, and the controls and trim all setup right, it’s a dream. You’ll find yourself holding off on engaging autopilot (as we believe at Angle of Attack, you should become great at hand flying! Now, I admit. I didn’t get too far into my climb- only about 13K, before I stopped, went back, and got screenshots. I really wanted to be able to show you guys something. Doing a full flight didn’t make a lot of sense. It was good to stop, though, surprisingly. My mind was in a whirl, and I couldn’t hardly believe just how great the whole process was. After a few hiccups setting up my flight controls, everything else was absolutely incredible. Cant’ say that enough. Sorry if the phrase is getting old! Reflecting back on my experience, I did notice that I have a serious lack of training on the aircraft. You see, in our 777 Training at Angle of Attack, I won’t be an instructor this time. So I haven’t had the time to dedicate to learning the aircraft. I feel, therefore, I’m in the shoes that many will be in the day they get the PMDG 777- I’ll have some knowledge from past experience, but there will still be a lot of gaping holes in my procedures. One big reason I was able to setup and fly this flight so easily is two fold. First, standardization by Boeing meant that I had learned a lot already by flying the 737. Second, all my time training and flying the 737 helped quite a bit. The difference is standardization vs experience. My preflight procedures are very incomplete, and I’m sloppy. I can more or less buzz through the overhead flows, set everything up, and get the aircraft in a ‘lights out’ state, meaning nothing is amiss. Procedurally, and with experience, I have a lot to learn in the coming days, weeks and months. This will no doubt be accelerated by the training I’ll get from Angle of Attack. It’s quite odd that I will be trained by what we do. But that’s just a testament to the great team we’ve built here at AOA. I have loved a lot of the aircraft we’ve worked with. Some I have naturally learned in more depth. But I’ll be honest, I wasn’t in complete love with any of those airplanes. I think it has to do with what aircraft one actually loves in the real world. 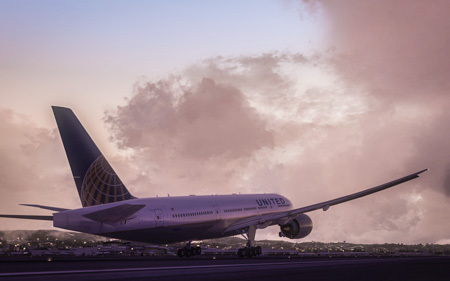 For me, the 777 is such a bird. I’ve always been so impressed by this airplane. 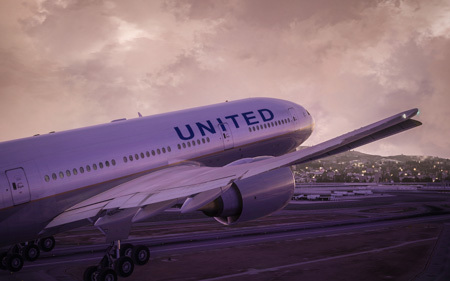 In fact, I remember when I was in my late teens, being in San Francisco itself, seeing a 777 lift up and suspend in midair, with what seemed to be an ungodly climb rate for that size of airplane. Between those types of experiences, and learning more about the 777 program, and how the machine was produced and built. What a revolutionary aircraft! And boy, does she look good too! 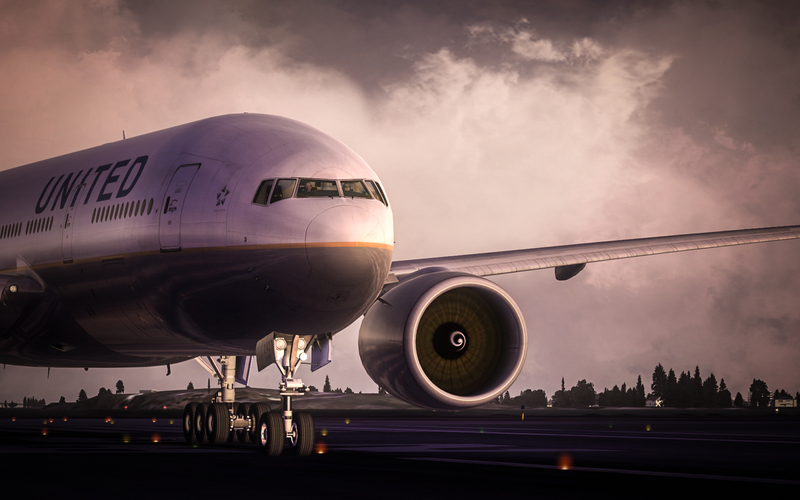 Things have only got better since the early days of the 777. 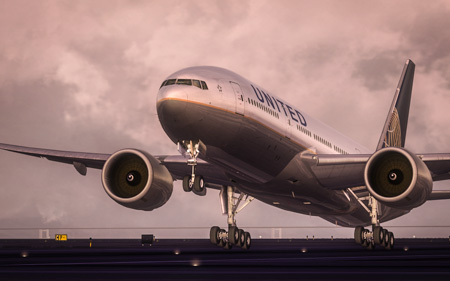 Now we have the 777-200LR, which is the model PMDG has used. She has some curves now, I tell you. The engines really do it for me. What a clean looking airplane! When you become more familiar with operations of the actual aircraft, you start learning things like it’s ability to do ETOPS 180, and the long, long routes it flies. Although, I’ve always been a long-haul kind of guy. I’m looking forward to getting to know more and more about the operations of the aircraft, more about the history of the aircraft, and getting familiar with the tools that PMDG has built into their 777 to make it more user-friendly, and a more immersive experience. I know that I’m going to have to put some study and time into it, though. Yes, my past knowledge will help. Yes, I’m already familiar with Boeing aircraft, and flying in general. But this is a whole new machine, with it’s own quirks and challenges that I need to learn. 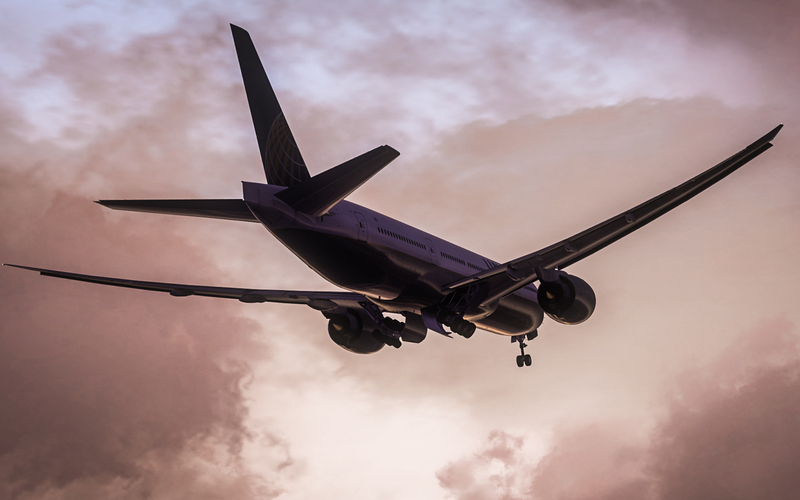 What an exciting time we live in with Flight Simulation! There were moments during this short, half flight, that I said to myself, “This is real.” It’s just looks so darn good! It’s truly hard to believe. I know we’re also very excited here at Angle of Attack to work with the aircraft. 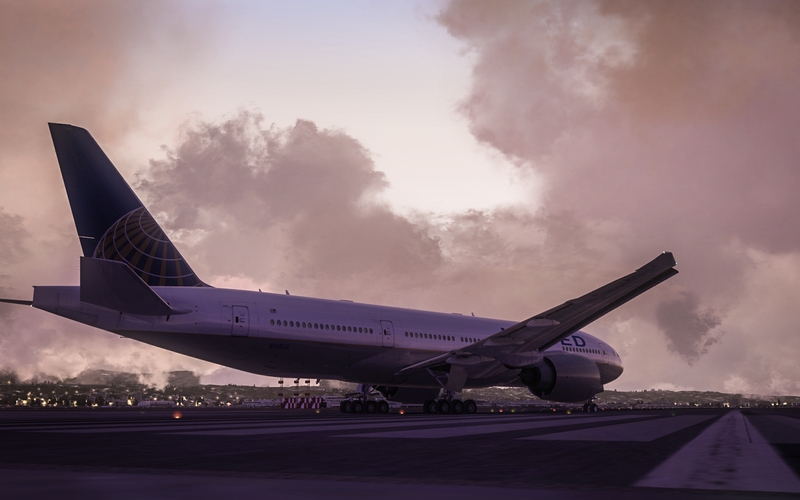 This has brought a lot of purpose to our work, getting to train all of you how to fly such aircraft as the PMDG 777. 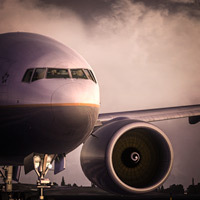 We’ll have more news on all that in the coming days, but I wanted to show off the 777 for now. .
If/when I do another post, I’ll make sure it’s a landing sequence somewhere. For now, stay tuned to our goings-on. 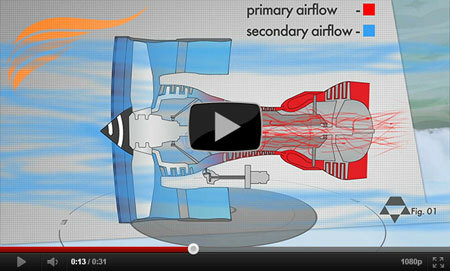 We have some exciting videos coming showing you the aircraft that you will no doubt find enlightening. In addition, we’ll be doing our big giveaway soon, which you can find out more about, and enter for free on www.777Training.com. We’d imagine all of these prizes, and the PMDG 777 itself, will fall into our laps in a matter of weeks. Absolutely awesome! The last time I felt this about a 777 was with PSS 777 (Phoenix Simulation Software)! Yeah… this is the most advanced simulation you’ve ever seen. It’s surprising just how much better it is. So you guys got the release candidate? That does bode well for the release this week doesn´t it? Mmmm, actually, the build we got is a beta. PMDG stated publicly they are still working on some bugs. We are on standby, but their timetable is their own. The sooner the better, of course! Sure looks awesome!!! Agree with Oliver, looks like there won’t be a problem then with the weekend release… I’m extremely excited now!!! Give it some time. Let the final bugs get figured out. I don’t know when it’ll be… hours or days, I don’t know. But it’s close, that’s for sure. Looks very nice. I live on short finals and see these girls fly over my house every day. Chris, you said you used “-20% power for my takeoff and climb”. ?? Yes, that’s what I set in the corresponding performance pages. TO-2, essentially. Funny, I’m more a short haul kind of guy. Once you’ve reached you’re flying altitude there little to none work todo. After 20-30 minutes I get bored. 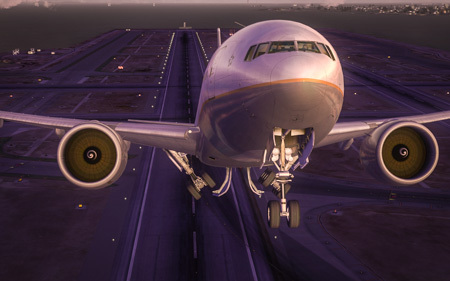 And taking te bird up into the sky, do something else for 8-12 hours and them come back for de decent and landing phase I call cheating.. Last week I’ve received the PMDG 777 captain manual set, so I’m ready to start with random failures on.. I know the QRH is available in PDF, but when you’re plummeting towards earth, PDF files are so easy to find the right part to recover (if possible) from the failure. Two weeks the 737 simulated a fuel leak. Suddenly you see the ‘unsufficient fuel’ message in the FMC.. To make things worse, I forget to turnoff failures for my VAFS flight, so when I safely landed on a nearby airport I got a very low rating.. It was even lower than the rating I got when I crashed a flight..
Can’t wait for the PMDG release. And yes, I will take it for a spin immediately without any training. No guts, no glory..
Everyone will be taking it for a spin, it’s tradition! Incredible shots! What Shader or ENB settings are you guys using? Using ENBSeries. I think it’s the one John Venema uses from ORBX. Ok thanks! 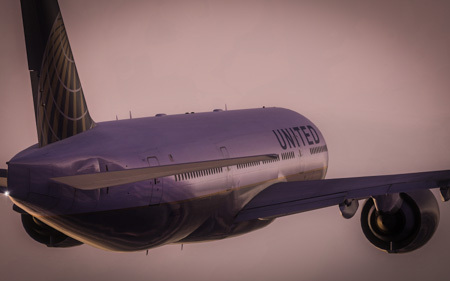 So it the “Purple Haze V2” ENB, right? 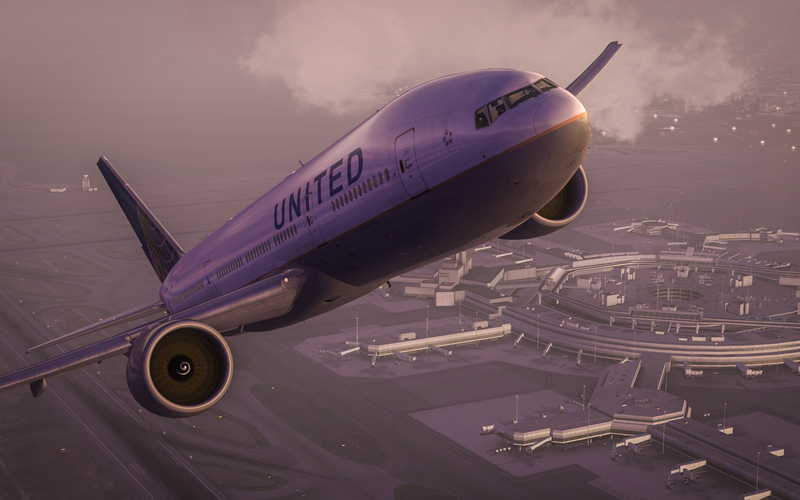 Those shots look like they’re from a new gen. PC game – can’t believe it’s really FSX! It look awesome!! What is your FSX settings? Yup! That’s part of it. Awesome slider maxed 😉 But really, I used Kostas Tweaks to set things up. This will be a new kind of experience. I already reduced real world work time load, at least -20% for this new adventure 🙂 So I am ready! Thank you for this first impression shots Chris! You’re very welcome! Much more to come. What kind of PC configuration should i take to run like this? Im looking for a cool config. That is a question I’m totally unqualified to answer. Please checkout Kostas Tweaks. He does a fantastic job. never tried PDMG, but a regular on fsx but generally fly GA planes. Is there anything for me? Absolutely there is. It’s a whole different world, lots of new challenges, and quite a dream. I’d highly recommend it! I work in an out of 777’s every day (QTR and AA) and PMDG seems to have gotten this bird down to the exact rivet, can’t wait to fly her around the world from to and from ORD. I know, right? Is it crazy? Other companies that have done this seem to always be a little off. I would very much like Nick to do a walkaround as he did with the 737. BTW Welcome back Nick and congratulations! Please what scenario did you use? Real pilots never see the outside of aircraft when they fly. They concentrate on whats going on inside. I want a even more realistic, inside, controls,procedures etc. I not interested how others see me. I want more of `what a real pilots see. I agree with you, though remember, this is a product we are purchasing.. and the external visuals are a massive part of it. I agree, I spend more time in the cockpit, but I absolutely love visuals, and even the wingviews give me a buzz. Knowing that they are of this standard motivates me to purchase it. How the heck do you get such graphics >>?? I mean just see those reflections on the plane !! How do you get them ?? Did you take them real time or using playback (for example FSRecorder)?? I always take them while in playback. That way I can focus on flying.